Yoshi’s is reputed to be a popular restaurant destination for the Japanese folks living in town, and we expected to find enjoyable food. Spoiler alert – all true. What we didn’t expect, though, was to be so thoroughly entertained by the proceedings. A bit of background – we’re lucky to be able to rely on a friend fluent in all things Japanese (thanks, KC) for help with evaluating what dishes we should try. As such, we walked into Yoshi’s with a good deal of knowledge of the more unusual options on their menu. So, long story short, we ‘order like the Japanese’. Or so said the perplexed hostess, prior to asking if we’d lived in Japan. Before that, our waitress did a double take on a few of our requested dishes, politely explained what they were, and went to some effort to verify that we actually wanted them. If this sounds intimidating, it shouldn’t. All was smiles, conducted with a good natured curiosity and genuine concern for our experience. It culminated with Yoshi himself, on the other side of the sushi bar, peppering us with questions, offering up specials and tips on ‘off the menu’ items, and showing off some of his more exotic sushi preparations. 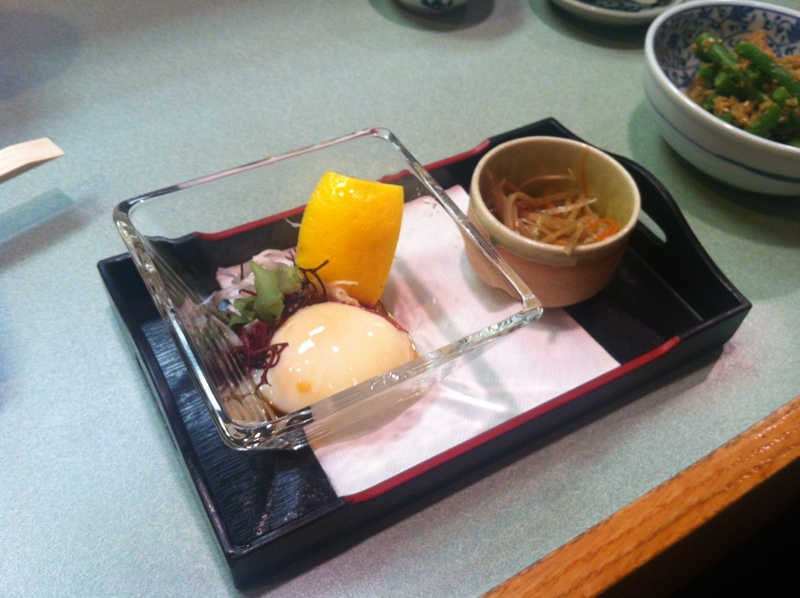 That, in the image above, is onsen tamago. Reminiscent of an oyster shooter, this very soft boiled egg is served chilled and topped with a little seaweed and a light dressing. We were advised to slurp it down in one go, and very much enjoyed the how the soft egg white yielded to reveal the wonderfully custardy yolk. The tako wasabi was one of the plates that, upon ordering, raised eyebrows among the staff. 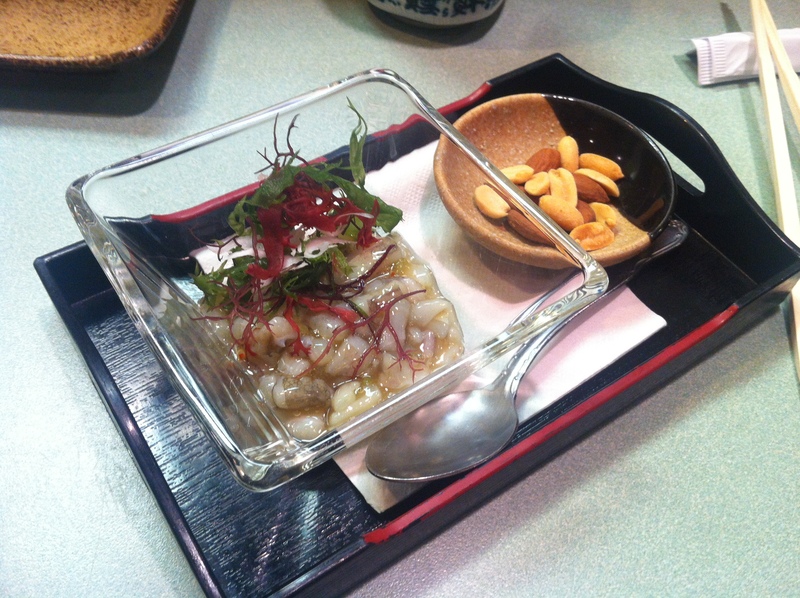 It’s a simple dish – raw octopus marinated in wasabi and salt. It was, at best, moderately chewy, and tasted mildly of the ocean. Even the kick of the wasabi was surprisingly mild. It all came together beautifully, and we loved it. 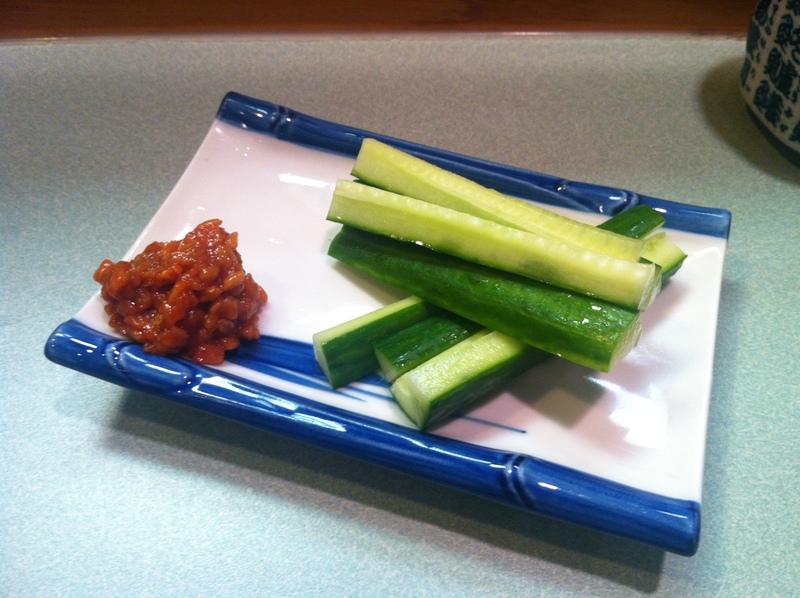 We also loved the moro q – strips of cucumber served with a nutty and deeply savory miso relish. It’s a great example of how two simple ingredients can sing when they’re so perfectly matched. Then, we took Yoshi up on his offer to taste the daily special, shishito peppers filled with a shrimp pate and tempura fried. 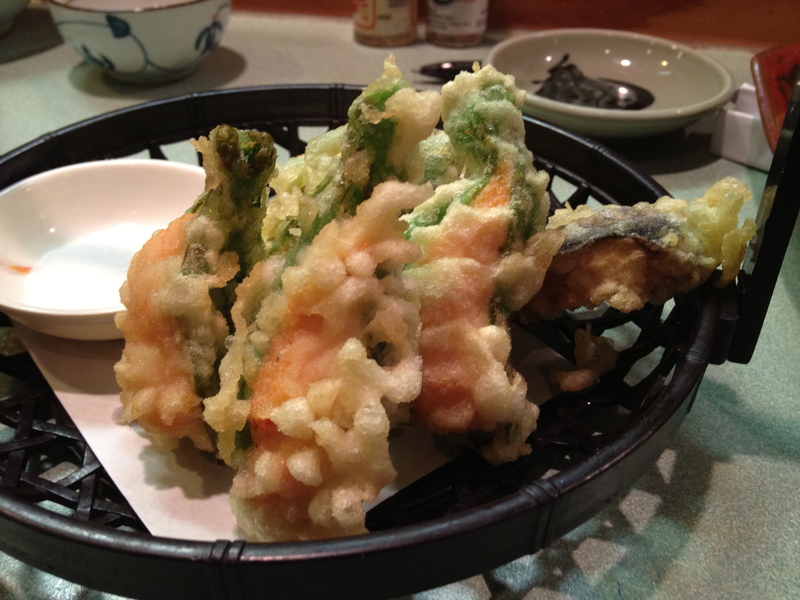 Think green pepper but subtler, shrimp flavor but denser in texture, and a pleasant contrast between crunchy and chewy. 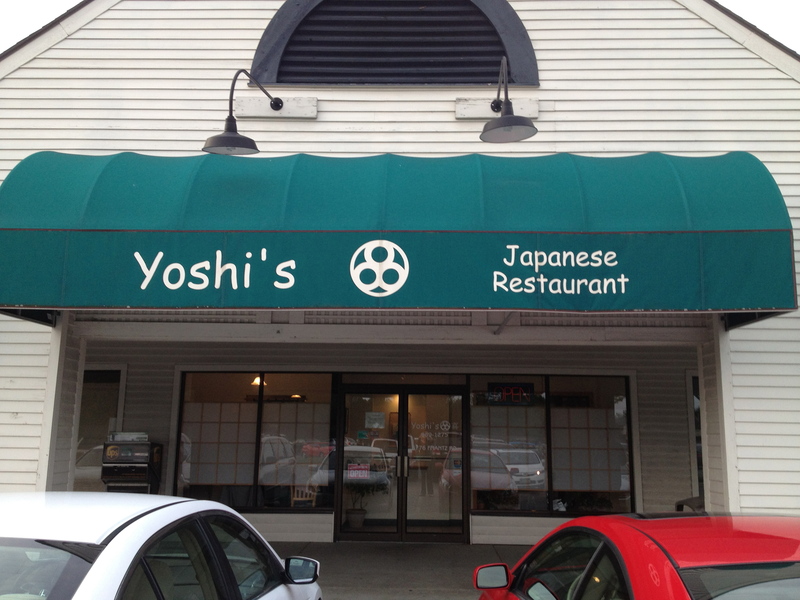 Finally, we were let in on a secret – Yoshi’s often prepares a few servings worth of okonomiyaki. It’s not on the menu, and not always available, but it is emphatically worth asking about. 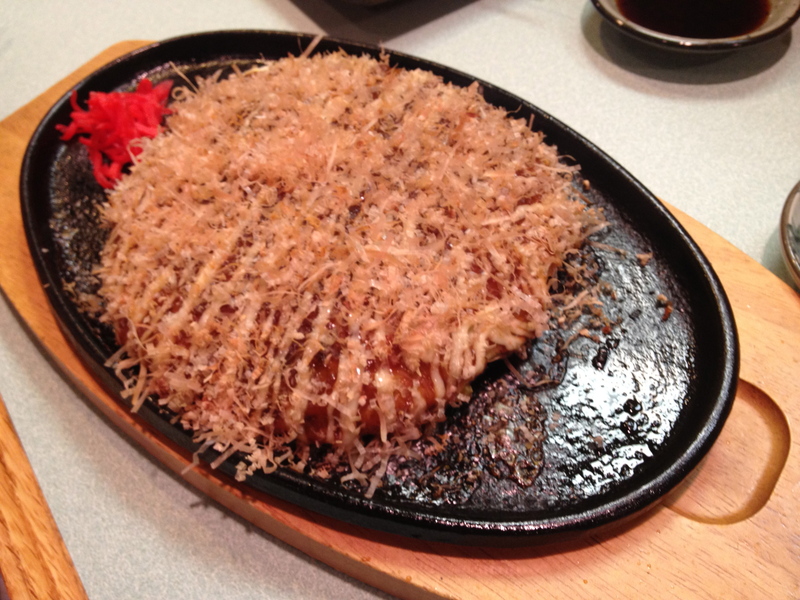 Okonomiyaki is a savory pancake filled with shredded cabbage and (in this case) small bits of octopus, and topped with an okonomiyaki sauce, a mild Japanese mayo, and bonito flakes. Yoshi’s version was easily the best we’ve ever tried. Yoshi’s also offers a wide variety of noodles, including soba, udon, and ramen. This entry was posted in Japanese, Restaurant and tagged izakyaya columbus, japanese restaurants columbus, sushi columbus. Bookmark the permalink. We had a great American-style dinner there this winter. Our daughter had great sushi and we enjoyed the soba and ramen soups. Thanks for the tips on some things we should ask for upon our return. Yoshi’s probably has the widest selection of noodle dishes of any of the Japanese restaurants in Columbus. There are also some good grilled squid and fish dishes (look for shio/salt grilled) and I like the green beans with sesame. We do not recommend the yakitori.